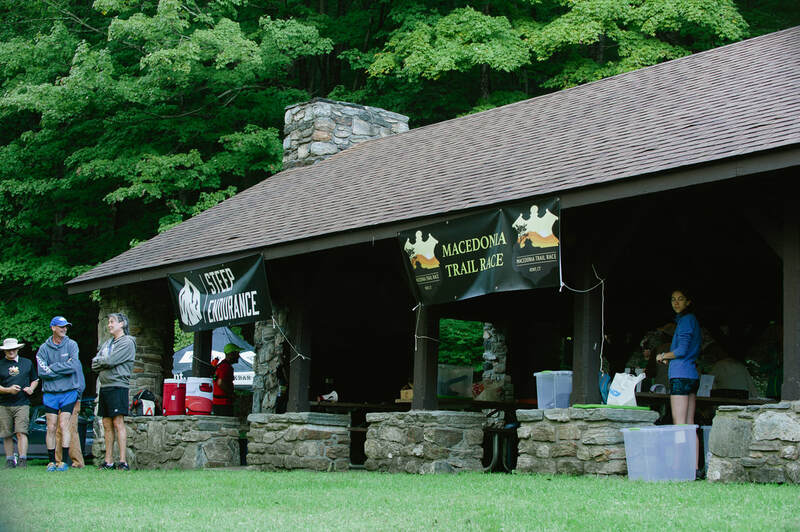 The 2nd annual Macedonia Trail Race will be held in Macedonia Brook State Park in Kent, CT. With its unparalleled single track and lush forest trails, challenging climbs/descents and 2-3 amazing viewpoints on course, the race offers trail runners a one of kind experience in the northwest part of Connecticut. You will not be disappointed! NEW this year we will offer 25K/50K distances in addition to the original 7.25M race. The Macedonia Trail Race is part of the Blue Blazed Trail Running Series in CT. For more information click on this link. Oh…and to have fun running in the woods! T-shirts will be offered to the first 100 pre-registered runners before September 5. Refund Policy: There will be no refunds and/or no transfers of your registration or bib to any other person. Entry fees collected are used to develop and produce the event, starting well in advance of the race date--including course preparation, race supplies, permits, and administration. Follow Route 341 west from the intersection of Route 341/Route 7 in the center of Kent. Turn right onto Macedonia Brook Rd. Stay left at the intersection of Macedonia Brook and Fuller Mountain Roads. Look for park signs. Race headquarters will be located at the Pavilion on Macedonia Brook Rd. inside Macedonia Brook State Park. Parking for the Macedonia Trail Race will be near the pavilion either in the gravel parking lots on either side of Macedonia Brook Rd. or in the grassy areas on both sides of the road. Please DO NOT park on Macedonia Rd. The 7.25 mile race starts on Macedonia Brook Rd., near the ranger station. Runners will proceed south until reaching the blue-blazed trail entrance on the left. The first 4/10 of a mile is on the road to help spread out the runners before entering the single track. Runners will then run the blue trail in the counter-clockwise direction. The first section of single track is not super steep per se, but it’s a grinding climb until the first major descent just over 2 miles into the race. From there it’s rolling with some pretty technical sections of singletrack with a few short road crossings. A little before mile 5, runners are faced with the challenging climb up Cobble Mountain and it’s amazing viewpoint to the west, where on a clear day, you can see the Catskill Mountains in NY. From there it’s a long technical descent back down to a left hand turn onto Macedonia Brook Rd. and a quick sprint finish on the grass near the pavilion. The 25K course will consist of 2 loops of the 7.25M course, plus a small out and back at the beginning of the race. The 25K course will have 3500'+ of elevation. The 50K course will be a 3 loop course utilizing some additional trails in the park, but will include 3 trips up and over the famous Cobble Mountain. The 50K course will have 7,000'+ of elevation. 25K/50K Course Maps COMING SOON! Will we have water and/or electrolyte drink at aid stations plus other typical food items (potato chips, pretzels, candy, etc.) for the Macedonia Trail Race. Keep in mind that Steep Endurance events are "cupless" races. Runners are required to carry their own hydration bottle, pack, or cup. This policy is put into effect in an effort to reduce the amount of waste and adopt a sustainable “green” practice for the race and the sport of trail running. Weber Road This aid station will be located about halfway through the 7.25M course as runners are coming off the trail and crossing Weber Rd., before re-entering the single track. We will also have an aid station at the end of each loop for the 25K/50K distances. These rules are meant to make your experience during any Steep Endurance event a positive one. Most of these are common sense type policies that you will see at any trail or ultra race. Absolutely No Littering! The race is on CT DEEP State Park land. Please respect that we are using their amazing and beautiful trails for this race. Failure to do so could jeopardize future events in Macedonia. Following the marked course is mandatory. Please do not cut the course, cut any switchbacks, etc. Any runner caught doing so will be disqualified. In addition, if you get lost on the trail/road you must return to the point at which you lost the trail. The course will be well marked with ribbons and other necessary course markings. Though the course will be VERY well marked, runners are ultimately responsible for knowing the course and carrying course maps if necessary. Please respect others that are on the trail. The trails on the course are open to the public and are fairly well travelled. Please announce your intentions to pass if you are coming upon a hiker or another runner. If you must use the bathroom, please try to do so very discreetly a good distance off the trail before returning to the race. If at anytime you intend to drop out of the race, please do so at an aid station/checkpoint by notifying the aid station captain. Surrendering your bib to the aid station captain will serve as notice of withdrawal/DNF for the race. Failure to follow these policies means somebody has to come looking for you. While this isn’t a marathon/ultra race, it is a trail race with some remote sections of trail, where we will be forced to have someone come looking for you and in some cases, local authorities (at your cost). Smoking is not permitted on any of the trails or at any checkpoint by runners (probably shouldn’t be doing during a trail race anyway). Alcoholic beverages are also not permitted in any sections of Macedonia Brook State Park. The use of personal music devices is strongly discouraged at this race. To enjoy all that our race has to offer and for the safety of all participants, Steep Endurance encourages a headphone-free environment during the running of the race. We believe your race experience and those around you will be greatly enhanced by leaving the headphones at home or in the car. Running headphone-free allows opportunities to develop camaraderie with your fellow runners and to enjoy everything the race has to offer. Plus, volunteers and spectators will be on course cheering you on and providing directions to help get you to the finish line. Runner safety will be a top priority for our events. SMILE and enjoy the race! You are lucky to be enjoying these amazing trails! ​Runners in the 25K/50K will receive special finisher awards with additional awards to the top 3 podium finishers in both overall and masters divisions. You’ve just finished a super challenging one of a kind course! Enjoy your accomplishment, sit back, relax, and don’t forget to cheer on all the runners coming in behind you! We will have the usual spread including bagels, bananas, pizza, non-alcoholic hydration options. We may even have some live music for you! **There is no alcohol permitted in Macedonia Brook State Park. Kent is an very quaint town with cool shops, great places to eat, and retail shops. There are plenty of places to stay in and around Kent if you want to make a weekend out of it. Click on this link for more information. September is a beautiful time of year in Connecticut with fall foliage just starting to turn. Average high temperatures range are usually in the low 70's with low temperatures in the 50's. That’s pretty much perfect running weather! The 2,300-acre Macedonia Brook State Park, originated with a 1,552-acre gift from the White Memorial Foundation of Litchfield in 1918. The park's exciting terrain has resulted from the slow wearing down of its hard rock formation base. The Blue Trail crosses Cobble Mountain and several other peaks, offering outstanding views of the Catskills and Taconics. Numerous springs and streams add to the pleasure of hiking. The land was once the domain of the Scatacook Indians, who derived their name from the nearby confluence of the Housatonic and Ten Mile Rivers. After Kent was settled in 1738, the Indians and settlers shared this area in comparative harmony. During the Revolutionary War, one hundred Scatacook volunteers operated a signal system along the peaks up the river valley. As the original Kent owners moved away or died, many of the woodland parcels west of the Housatonic were sold or left to a commercial and farming settlement called Macedonia. Commercial activity in Macedonia included cider, grist, and saw mills in addition to a substantial iron producing industry. The local company store was a thriving business and bustling gathering place where teams constantly arrived and departed. The iron industry played an important role in early Connecticut history. Operating both in Kent and the village of Macedonia, the Kent Iron Company's iron furnace, two forges and a puddling works converted cast iron to malleable iron. Most of it was modified into a variety of implements, such as crowbars, wagon wheel rims, and agricultural instruments. Remains of the second forge, a stamping works, are still visible at the southern end of the park. Because these processes required vast amounts of charcoal, by 1848 all original timber had been used. Only at this time was a committee formed to prevent the waste of wood. Eventually, competition from larger Pennsylvania mines forced the Macedonia furnace to close in 1865. Many years later, the National Park Service established a Conservation Corps Camp at the park and much site improvement work was accomplished.